Stay at Quest Apartments Eight Mile Plains and SAVE! 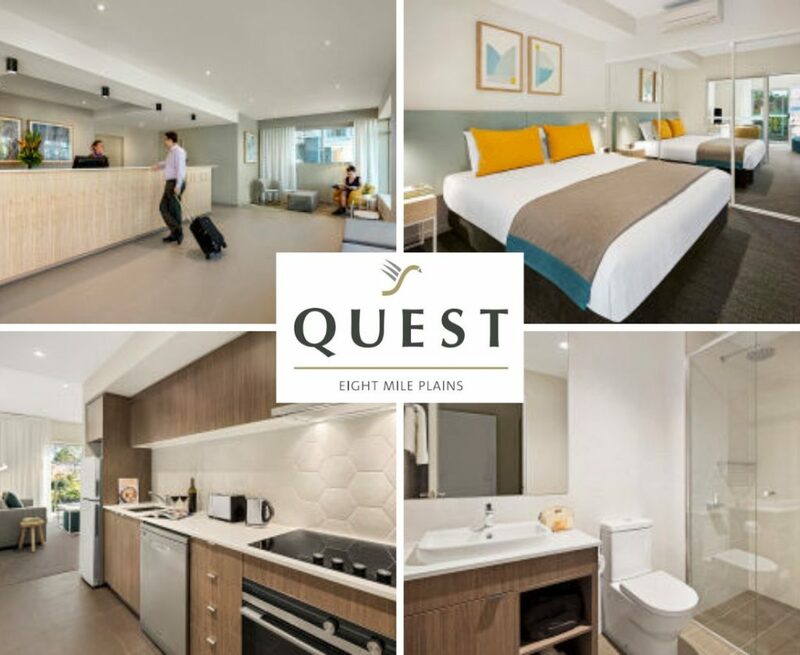 Quest Eight Mile Plains serviced apartment style hotel rooms offer a relaxed and comfortable accommodation experience perfect to enjoy the SPRUKE Festival weekend or for our out of towners stay a little longer and enjoy more of Brisbane. 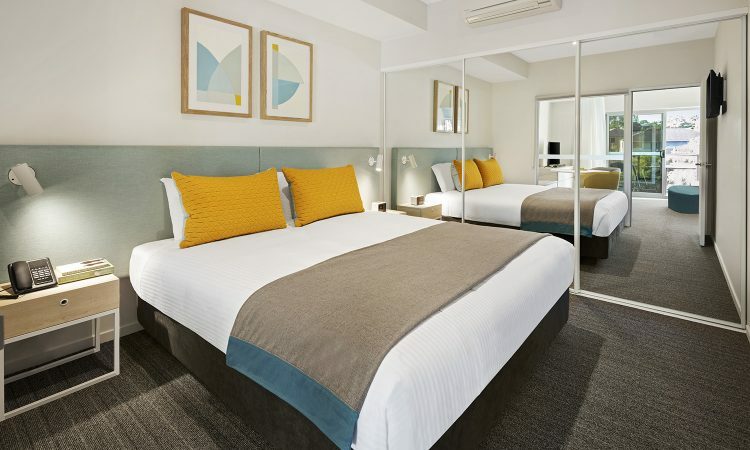 Staying at Quest Eight Mile Plains you’ll enjoy brand new serviced apartments just a five minute drive to the SPRUKE 2019 Festival precinct at Sunnybank Performing Arts Complex (SunPAC) and Sunnybank Community and Sports club. Located in Brisbane Technology Park, Quest Apartment Hotel boasts quick and easy access to both Brisbane and the Gold Coast via the Pacific, Gateway and Logan Motorways. We are very excited to welcome Quest Eight Mile Plains as a SPRUKE 2019 Sponsor. Quest has given us a great affordable accommodation deal, with discounted rates and extras just for Sprukesters and their families. Quest Eight Mile Plains features 90 brand new serviced apartments including Studio, One, Two and Three Bedroom Apartments. Studios with kitchenettes are the perfect alternative to a hotel room and the One, Two and Three Bedroom Apartments are ideal for families, or larger groups looking for a home away from home experience with full kitchen and laundry facilities. There are also accessible rooms available. * Secured on-site parking- safe when returning late at night! 1. Choose your dates and number of guests. 2. Enter the Promo Code- SPRUKE. 3. Choose your style of apartment. The booking code can also be quoted for those that prefer to book over the phone. Call Quest Eight Mile Plains +61 7 3736 2800 to book. To add transfers and/or breakfast, call Quest Eight Mile Plains after making your booking. Your extras will then be added to your reservation. Sofa beds can be added during the online booking process. SPRUKE guests can ask for an 11 am late check-out at no extra cost (an extra hour). Please Note: Any check-out after 11 am will be charged at $20 per hour. The Quest reception will safely store guests luggage, after checkout until Sunday afternoon. Each person’s luggage being stored will have a luggage tag attached to avoid any mix ups. Reception hours 7 am – 10 pm Monday – Sunday. You can check out, leave your luggage at reception and come to the festival and return to collect it on the way home! Peace of mind. Quite apart from the spacious, comfortable rooms, and great amenities Quest Apartments is perfectly located for SPRUKE festival goers. Quest Eight Mile Plains is five minutes straight down Padstow Rd where it changes its name to McCullough Street. Quest has added an option extra Each Way Transfers to their SPRUKE package if you need transport to SunPac at $6 per person. A safe and affordable option to get back to QUEST after the evening events. Alternatively you can catch the 155 bus or get in a brisk 30 min walk. Get more tips on getting coming SunPAC from a local BUM Jim Bills in this post! Well if you, or the rest of the family aren’t spending every available minute at SPRUKE Festival, Quest Eight Mile Plains is conveniently located to many attractions. Westfield Garden City, one of Brisbane’s premier shopping destinations, is just 2.4km away. Southbank Parklands, QPAC and the Queensland Museum are a 20 minute drive straight down the M3. Going the other direction you are just 40 minutes from Warner Bros. Movie World. Bring the family, stay a little longer at Quest Eight Mile Plains and enjoy the fabulous spring weather and all the attractions Brisbane has to offer. Big thank you to our sponsor Quest Eight Mile Plains. Keep an eye out for a competition where you could WIN your stay at SPRUKE Festival 2019.